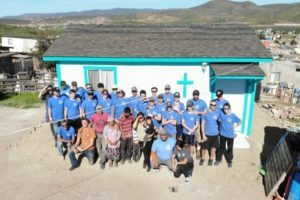 I organized a father/son mission trip through Youth with a Mission (YWAM) Homes of Hope, Ensenada when the boys were in 7th grade at NCA. They have been begging to go back again ever since, so this past January, 11 dads and their 11 sons flew to San Diego for a weekend. Out of the eleven boys, seven of them already attend King’s and another two of them will be attending King’s after they graduate from Northshore Christian Academy. When they arrived in San Diego, YWAM picked the boys and their dads up and drove them down to their base in Ensenada where they stayed for the next 3 days. 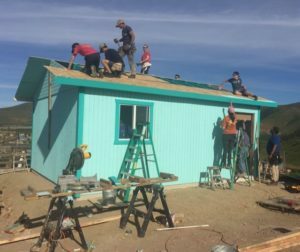 They began construction on a 16′ X 20′ house for the Aparicio Alvarado family the very next morning working side by side with the family members all weekend long. By Sunday, the house was complete. This family of 4 – a mom, a dad who earns $68 dollars a week, a grandma, and a baby son – had been living in a shack on their property. By the end of the weekend, they had a two bedroom home complete with electricity, their first refrigerator, beds, and a table and chairs. They were able to lock their doors for the very first time and put their child down on the ground to play. The team also took the family shopping for food and other household necessities. More than that, the team shared the gospel with the family, and both the father and the grandmother accepted Jesus. Even though this was a short trip, it had an amazing impact on all who were involved. 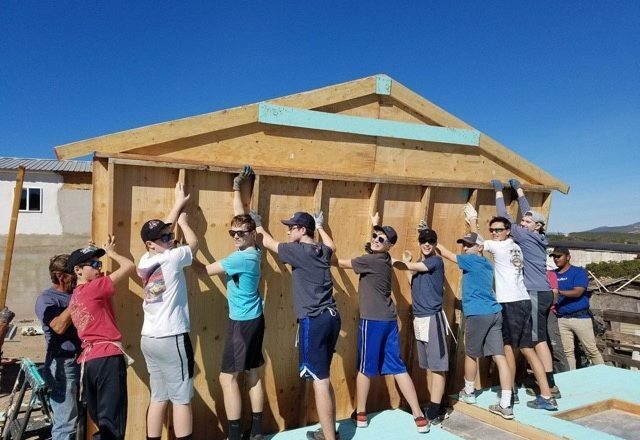 The boys truly had the opportunity to feel like the hands and feet of Jesus as they went into the world and made a tangible difference in the lives of a family. Their faith was strengthened as they learned to serve selflessly, they grew in gratitude for the lives they have been blessed with, and they learned what true compassion and empathy looks like. Moreover, they had a weekend to bond with their fathers and learn how to build something truly amazing.